The council launched a pilot triage inspection service in October last year to help highways contractor Ringway respond to reported defects more effectively and efficiently. It said this new approach has so far reduced costs by around £730,000 – savings that will be reinvested in the service. Terry Douris, cabinet member for highways, said: ‘The council is responsible for maintaining over 3,000 miles of roads and this new process helps us determine what intervention is required to ensure roads are as safe and well-maintained as possible. The new triage approach means that when a fault is reported, a qualified inspector carries out an assessment and arranges for the ‘most appropriate work’ to be carried out. This may be to permanently repair an individual pothole or to plan the resurfacing of a wider area of road. Previously highways teams had responded to hazards reported by the public (such as potholes described as 50mm deep or more) by sending a full crew to repair them or make them safe. Using inspectors to assess faults allows better planning, so crews can carry out more permanent and larger-scale works to repair multiple faults, the council said. In this way the council appears to have made both efficiency savings and avoided some reactionary repairs, although it is unclear exactly where the balance lies on the announced savings. Under the pilot, triage inspectors assessed 7,699 carriageway and footway defects in a six-month period. The council said that by the autumn, the triage inspection service will be fully operational, with 10 inspectors operating from its four highways depots. 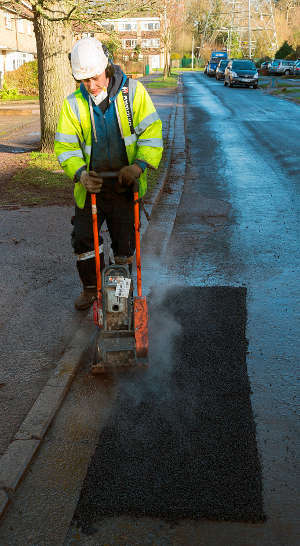 Separately, the council said it has almost completed its summer programme of resurfacing works with surface dressing carried out on around 70 roads - a total of 705,000 square metres of carriageway.